Jennifer 2 novembre was Alla helgons dag, which in Sweden is dedicated not to saints, but is observed more generally as a memorial for the dead. The day is a röd dag in Sweden, which means that it is an official day off of work, but it fell on a Saturday this year. Friday was therefore technically supposed to be a half day, but somehow everyone stuck around for the whole day. 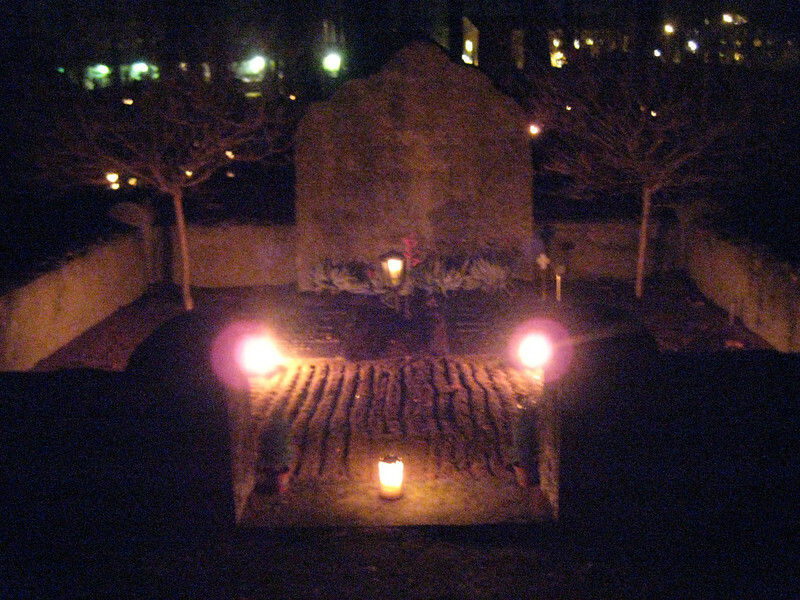 I'm glad I did, because it wasn't until afternoon fika, surrounded by the jack-o-lanterns from Thursday evening, that my advisor suggested that we go to a cemetery sometime the next day, preferably in the evening, because many graves would be decorated with candles. So off we went to the large cemetery (last seen in this blog from the #2 bus) near Uppsala Cathedral. 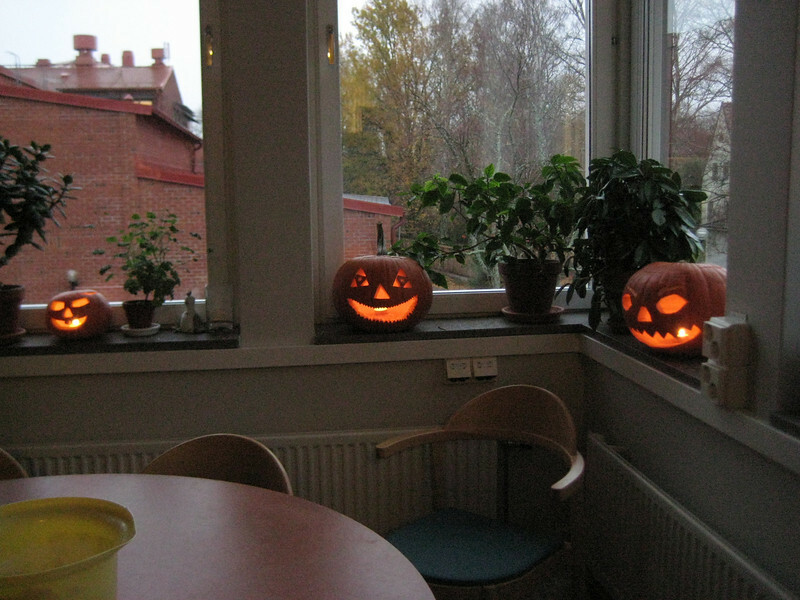 We left Blodstenen at 16:00 to take advantage of the very last moments of light in the sky, and walking through a nice neighborhood we saw a porch with a tiny jack-o-lantern on it! (No picture of it, though, because there was already someone there taking a picture of this strange apparition.) A couple blocks later, we were standing at the southwest entrance to the sprawling Uppsala gamla kyrkogård, which is the newer portion and had some very fresh graves. I feel that I can't adequately describe the setting visually, and of course it's hard to take pictures in the dark, but please see the picture gallery to help get a feeling for the ambiance. I just kept saying to Joe "This is sooo cool!" and anyone out there with an affection for the macabre would agree with me. As the sky darkened, bright stars could be seen through the naked branches of the trees, with the north star being nearly directly overhead (and therefore less useful as a compass point). Lots of people were hustling to and fro, which feels strange when it's completely dark (it felt more like a game of "Ghost in the Graveyard" than anything else). Everyone was dressed casually as usual, and most people were in groups of threes and fours, and could be heard talking and even laughing, although plenty of people were standing silently and contemplatively. The atmospheric conditions contributed mightily to the mood: the air was crystal cold, with no wind at all, which meant that your exhalations took several second to disipate. Strange enough when it's you, but very odd looking indeed when everybody around you also has a halo of fog about their heads. It was very dark, even in the middle of the city, and the deep twilight that we started in turned to night quickly. 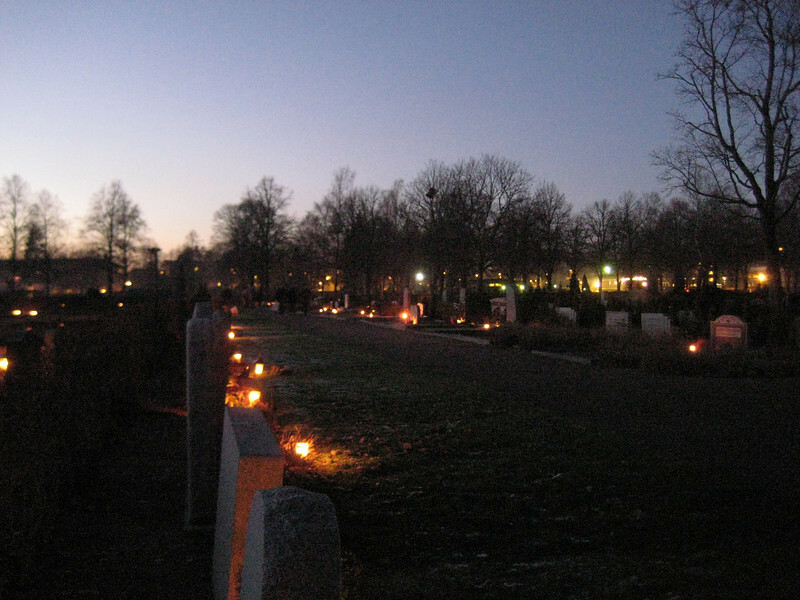 There were more lights in the newer portion of the cemetery, where we started our walk, than there were in the older part, both because recent graves have more relatives to attend to them, but also because the newer graves are smaller, and there are more of them and they are closer together. The new part was beautiful, with so many lights; the old part, beautiful but also downright creepy. In the area where the new was transitioning to the old, I sat to rest on a bench (which I found by nearly tripping over), while Joe wandered off in a different direction—he got a little bit lost within moments. Did I mention it was cold? The whole tour took only about an hour, but that was enough. I at least had dressed more for a cold autumn day rather than a mild winter day, and by the time we reached the cemetery exit, I was happy to get myself to the nearest bus stop and head home for a welcome hot chocolate and leftover Halloween candy. That sounds fantastic! I had 50 some kids trick or treat at my door, on Halloween, then Marc & I went off to a party -- I resurrected my Xmas tree costume, and he was a red lego.